The welcome rain continues to bring relief to the parched veld and urban gardens. Within days new shoots are greening up and animals appear to be coping, if not revelling in the fresh rainwater. Though we have a long way to go before the strict water restrictions can be eased. Interesting to note the animals’ fur ‘fluffled up’ to create thermoregulation which helps to insulate and retain body heat. Happily I recently spotted one of the young mongooses crossing the garden patio. It’s old enough to be independent now and to forage on it’s own. The family has been skittish, laying low as a caracal (lynx) has moved into the area. Put a predator in the mix and there’s a palpable sense of alertness. The dassie (rock Hyrax) colony which live below along the rocky shore are hyper-vigilant, doubling sentry duty. Their urgent alarm calls ring through the air and send everthing diving for cover of safety. A caracal’s range may extend to a large area, but with the recent fires, there is scant vegetation cover and perhaps meager pickings for a lean hungry predator. Meanwhile gardening chores are undertaken with a degree of caution. This week’s photo challenge is to tell a story with three photos (see the details here). 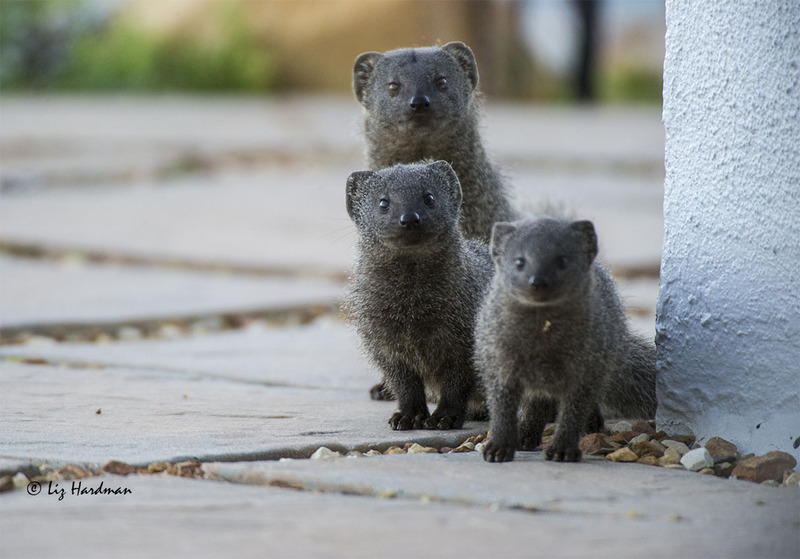 Just as dusk was falling we had visitors across our patio: Mongoose with her pair of offspring. We were first alerted to their presence by the insistent alarm calls of the roosting birds. They were just passing through and Mum shepherded them into the nearby vegetation and the birds settled back down again. Wrapping up the day, in the late afternoon a young caller came past the patio doors, a quick look in as if to wish us well on this, a most perfect of Christmas days.